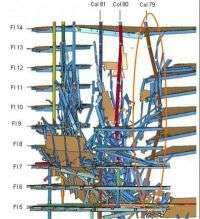 The National Institute of Standards and Technology (NIST) today released its final report on the Sept. 11, 2001, collapse of the 47-story World Trade Center building 7 (WTC 7) in New York City. The final report is strengthened by clarifications and supplemental text suggested by organizations and individuals worldwide in response to the draft WTC 7 report, released for public comment on Aug. 21, but the revisions did not alter the investigation team's major findings and recommendations, which include identification of fire as the primary cause for the building's failure. In response to comments from the building community, NIST conducted an additional computer analysis. The goal was to see if the loss of WTC 7's Column 79—the structural component identified as the one whose failure on 9/11 started the progressive collapse—would still have led to a complete loss of the building if fire or damage from the falling debris of the nearby WTC 1 tower were not factors. The investigation team concluded that the column's failure under any circumstance would have initiated the destructive sequence of events. -- Explaining in greater detail the computer modeling approach used to define where and when the fire in WTC 7 started and the extent of window breakage as a result of fire. The complete text of the final WTC 7 report, a video describing the WTC 7 investigation findings, a of all comments received on the draft WTC 7 report, a chart tracking the progress toward implementing all of the NIST WTC recommendations, and other materials may be accessed at wtc.nist.gov . who are this guys are tryign to foll? how dumb they think people are? If morpharse is any example, very.